What’s the fuzz about PPM and UDI? Disclaimer: I’m just a hobbyist. I’m no expert in radio- or signaling-theory. These are self-noticed issues and what I’ve read on different forums. In picture above we can see a PPM-signal in scope. First channel starts on first rise and ends when second channel rises. The -100 to +100 value for the channel is determined from the width of the pulse. 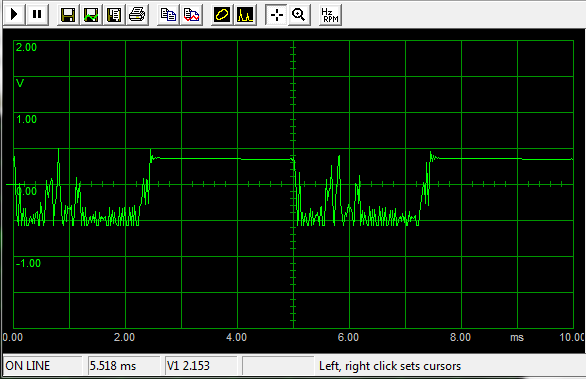 Total length of transmission packet (time between times channel 1 is repeated) is 20 ms.
What we can clearly see is that when channel is at -100 the length of channel 1 signal is clearly 1 ms and when at +100 the width is 2 ms. So far so good. Now, let’s do some calculation with normal heli-setup. Usually we are transmitting 8 channels. That means 8 times the max channel width 2 ms, that is 16 ms in total. After the last channel is sent there needs to be a certain amount of blank detection time for the receiver to understand that next signal is again channel 1. This gives us a usable total time of 20 ms with 8 channels allthough in theory 8 times 2 ms = 16 ms would be all we need. 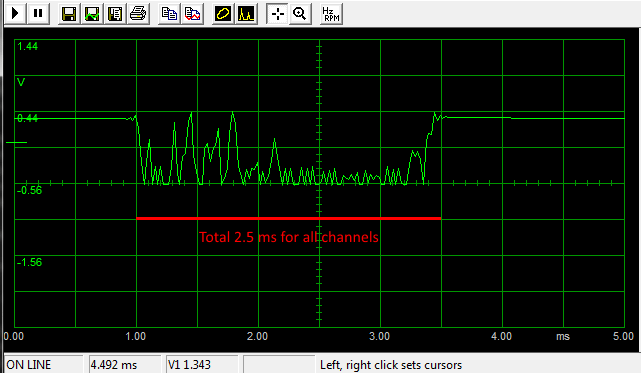 So in conclusion every channel is repeated quite near every 20 ms. But. Channel signals “move” inside the 20 ms time-frame. Let’s say channels 1 -5 are all at -100 value. This means channel 6 comes in at 5 ms time from the start. Now lets put channels 1 -5 to +100 value. Now channel 6 comes in at 10 ms. (5 x 2 ms = 10 ms). This is because of “chaining” the channels, so the exact time of when channels are sent are always depending on where the previous channels are what comes to their value. This does not concern channel 1 so much, it is always the firs within the 20 ms time frame and is always between 1 ms and 2 ms in width. Why not adjust 20 ms to shorter? Well, in theory that works. Problem is that there is a minimum. We need the 2 ms per channel and the blank detection time. So practically the 20 ms is the minimum if/when the receiving unit (gyro) is using blank detection time. If gyro uses pulse count instead the frame-time can be shortened to (in practice) 17 ms.
All 8 channels are transmitted within fixed time-frame and the total time of all channels transmitted is not depending of channel values. We can zoom in a bit. The advantage of UDI is very apparent in the scope-picture above. All channels are always sent in a fixed time of approx 2.5 ms and since the signal is digital there is no blank detection time needed. The frequency of transmission is determined of output period-setting. Unfortunately I can’t read digital signal in byte-level so I can only see the signal not the data. PPM – All 8 channels at +100 value, if blank detection time is ~4 ms then total minimum time is 20 ms. This means that channels value is repeated every 20 ms to gyro. That is 50 times in a second. The question is, what is the tightest timing VBar accept’s? In scope 5 ms is working but I have not confirmed this with VBar. If we choose auto in Jeti the timing is 10 ms. This is of course not possible in practice since transmitter can refresh channel (stick) values in max 100 Hz frequency, that means in UDI we get the maximum value refresh-rate of 100 times per second. The fuzz is about errors in VBar when using UDI. More specific it’s VBar loosing signal synchronization and in worst case scenario dropping the heli from air. According to forum-consensus (great link here) this has to do with a bug in Jeti-firmware regarding failsafe. 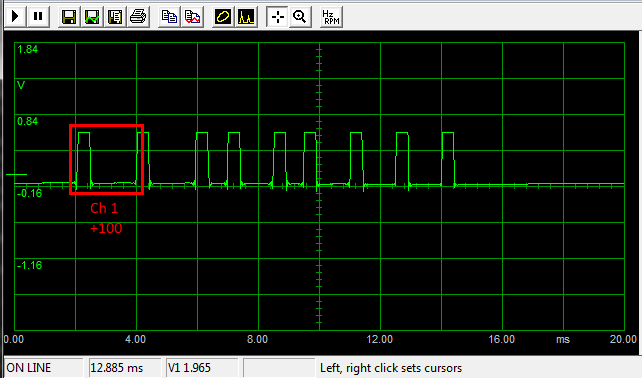 These errors occur when failsafe is off in receiver and transmitter frequency is set to 50 Hz. Also it seem’s apparent that the signal-wire from receiver to VBar is prone to disturbances. So, always make sure You use as short cable as possible, try to route the signal-wire so it’s so far away from everything else as possible. A ferrite-ring is possible a good thing also. I did extensive tests with my setup and I did not get these errors in any way even when using 50 Hz and failsafe on. This is most likely because I’m using newer firmware compared to cbdane’s testing with older firmware. This can also be confirmed when reading forums. Why would You use PPM, it’s slower? Well, in my opinion with current firmware there is no point in using PPM. It’s slower, it’s not synchronized ie. channel input-values are not at fixed time-points. Also UDI is digital, it is by technology more precise. Do You notice the difference in time regarding refresh-times? Most likely not. I mean really, 50 times in a second compared to 100 times a second? How fast does a heli move? how responsive is a heli in the air? Why would You use failsafe off isn’t this dangerous? Failsafe should be set in VBar not in the receiver. When there is no transmission it’s the VBar that should determine what to do. This is the safest way to do failsafe, do not trust the failsafe to receiver when using VBar. Now, just go out and fly Your heli and enjoy!